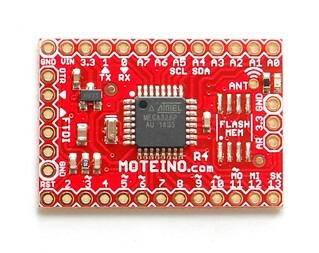 Moteino R4 – same as R3 except it can take RFM69W/HW transceivers. It replaces R3 and R2. Includes the FLASH-MEM option, comes with DualOptiboot, and has a full GND pour on both sides. Also ENIG lead-free finish. Needs an FTDI Adapter for programming. 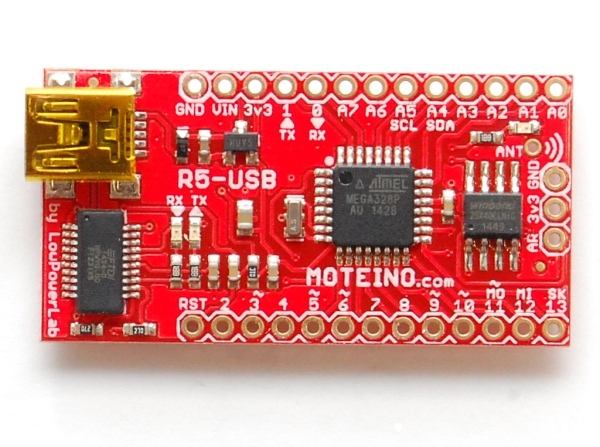 Moteino R5-USB – same as regular Moteino but has built in USB serial bridge which allows direct programming through a mini-USB cable without a separate FTDI Adapter. 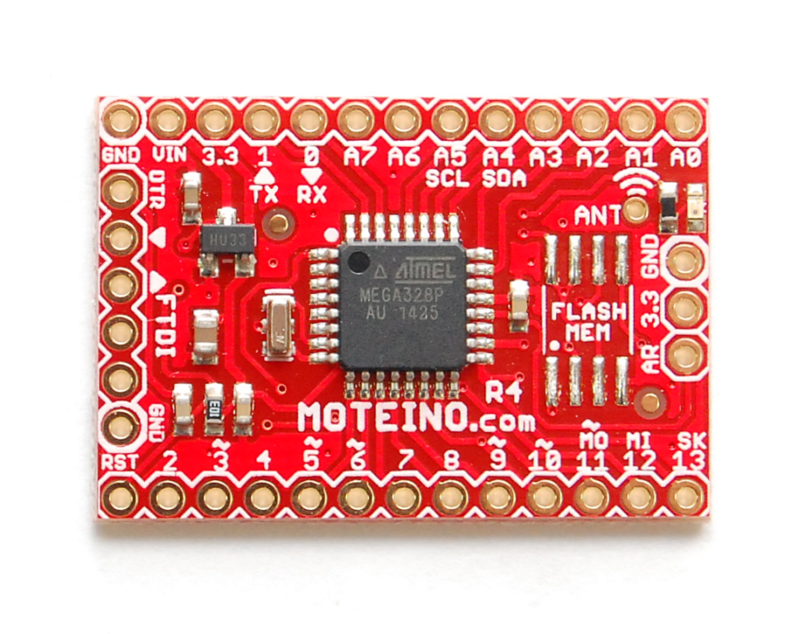 MoteinoMEGA – Moteino based on atmega1284p with 128KB of internal flash and 16KB of RAM for the most memory demanding sketches. A bunch more IO and an extra hardware serial port make it the ideal choice for for more complex projects. 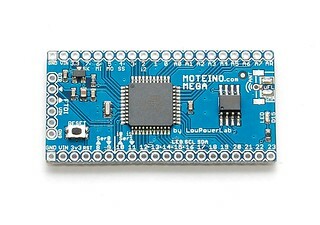 MoteinoLR and MoteinoMEGA-LoRa – Same as other Moteinos, except they work with RFM95/96 LoRa and RFM69HCW radios, see the LoRa page for more details. 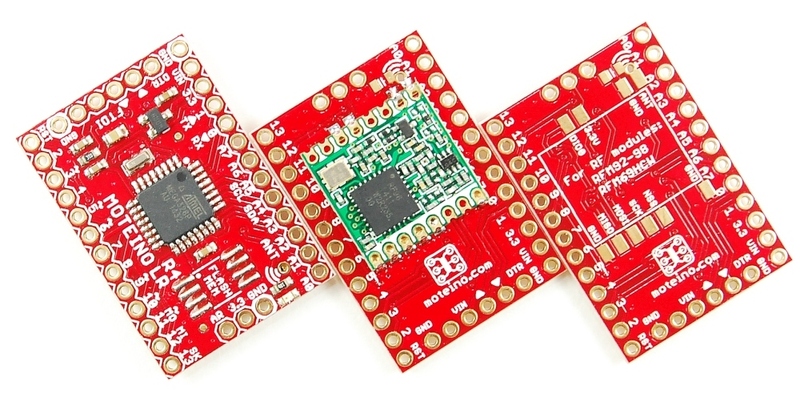 R3 – same as R2 except with support for the new RFM69W/HW transceivers. Includes the FLASH memory footprint and loaded with a modified Optiboot bootloader (DualOptiboot) to allow wireless programming. Moteino R2 – Green mass produced PCBs. Includes the FLASH memory footprint. Loaded with a modified Optiboot bootloader (DualOptiboot). Moteino R1 – The first Moteino revision. These were produced at OSHPark (purple), did not include a FLASH footprint, and had slightly different bootloader and fuse settings. Some early orders received this version. 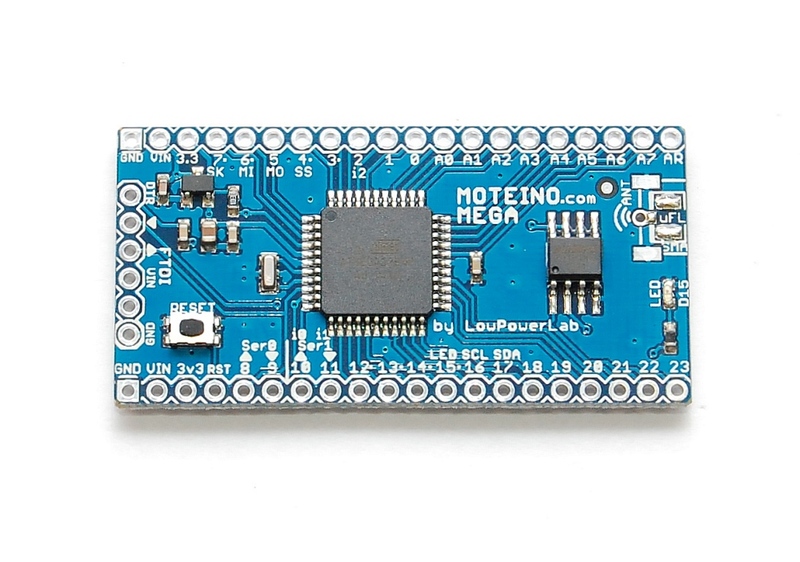 MoteinoLeo (discontinued) – Arduino Leonardo variant based on the ATMega32u4 chip and Caterina bootloader. It has been discontinued, but you can find some of the the design files on Github. For the initial prototype details click here.